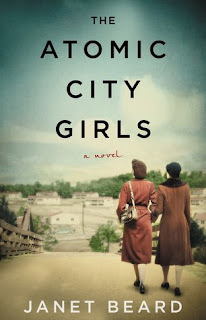 Summary (from the inside flap of the book): In November 1944, eighteen-year-old June Walker boards an unmarked bus, destined for a city that doesn't officially exist. Oak Ridge, Tennessee, has sprung up in a matter of months--a town of trailers and segregated houses, twenty-four-hour cafeterias, and constant security checks. There, June joins hundreds of other young women operating massive machines whose purpose is never explained. They know they are helping to win the war, but must ask no questions and reveal nothing to outsiders. The girls spend their evenings socializing and flirting with soldiers, scientists, and workmen at dances and movies, bowling alleys and canteens. June longs to know more about their top-secret assignment and begins and affair with Sam Cantor, the young Jewish physicist from New York who oversees the lab where she works and understands the end goal only too well, while her beautiful roommate Cici is on her own mission: to find a wealthy husband and escape her sharecropper roots. Review: This is such a good and interesting book! I liked the story, the history (all based on fact), the characters, the setting, and cultural look at Tennessee in the 1940s. June is so likable and I wanted her to be happy and educated. Sam helps to bring some of that out, especially her interest in physics and the world outside rural Tennessee. Making him Jewish connects the war in Germany with those here in the States. I am also glad that the author included African American characters, showing the differences, the struggles, and the contributions they made. Oak Ridge, Tennessee was a town constructed in a few months with housing, offices, factories, and all that a town needs. It ran 24/7 since shifts happened all day long. Built by the African Americans and lived in by the whites, Oak Ridge seems to have been a microcosm of the larger society. And the historical setting of this book is super interesting: mining and creating the uranium for the atomic bombs that would be dropped on Japan. I had no idea that all of this happened. The one funny thing about this book is the epilogue; it's what I've always wanted in a book and now that I got it, it feels strange. The author sums up each main character's life--who they married, the children they had (or didn't), etc. I loved knowing it all, but it felt strange. I say read this book!